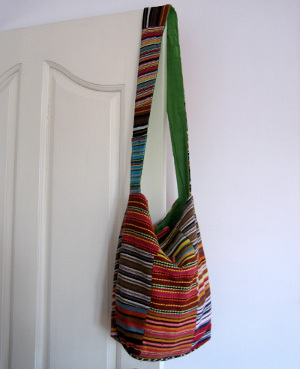 A cool handbag with a string long enough to let it hang on your shoulders comfortably without slipping off every now and then; you can easily hang it cross body too. A cool handbag with a string long enough to let it hang on your shoulders comfortably without slipping off every now and then; you can easily hang it cross body too. The wonderful array of soothing colors with horizontal patterns will bring an extra edge to your style. With loads of space for lots of stuff, this 13" x 14" cotton bag sure is steal for $20.